My latest focus was on a water theme. 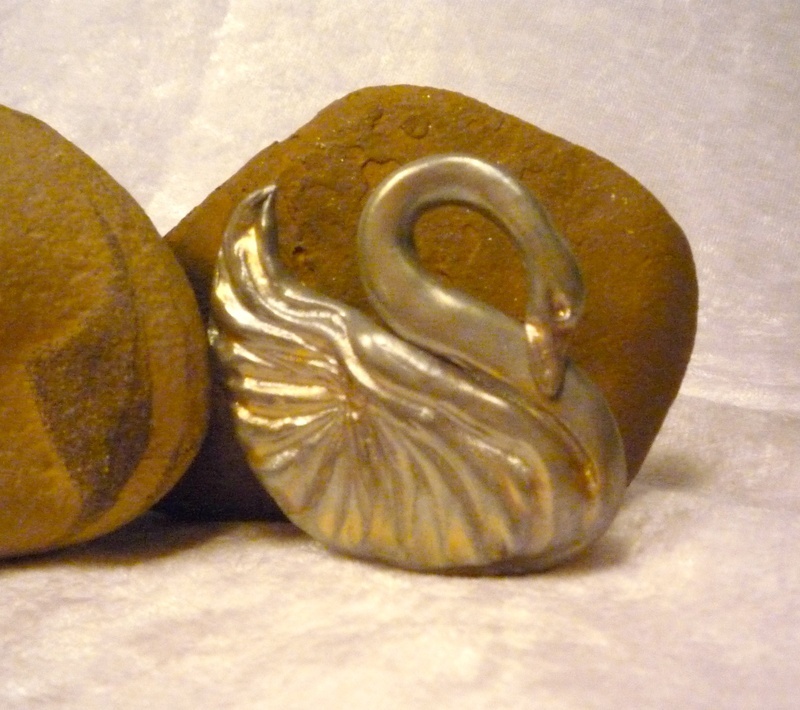 I finished three swans, each different from the other, all brooches. 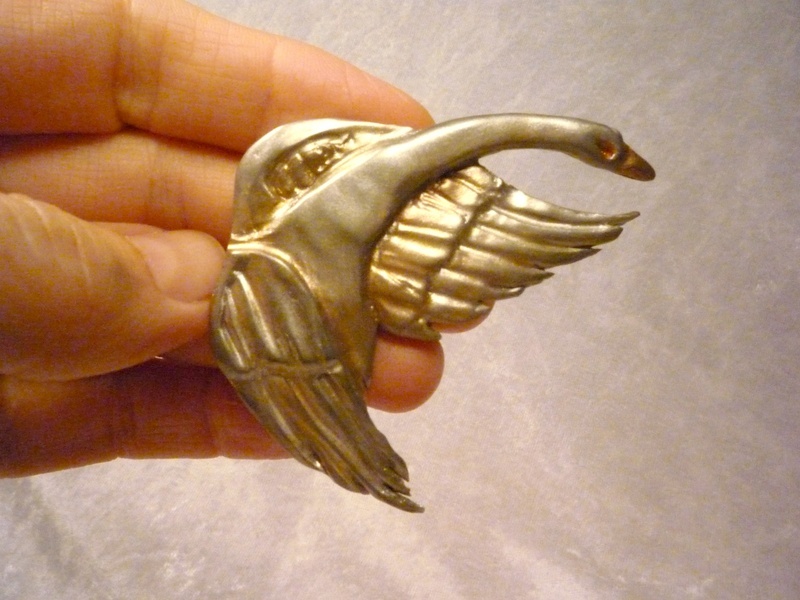 Unlike some of my recent brooches, these do not have the Inuit or the steam punk look. I also created a couple of water lily pins in keeping with the water theme, but I am not going to include them in this post. 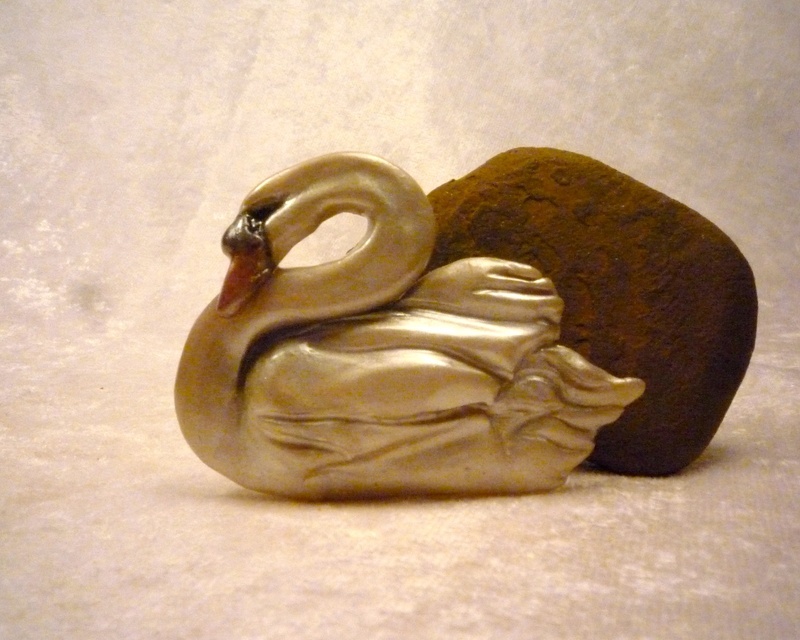 The first of the three swans was a fairly realistic piece, somewhat stylized, but softly realistic in color and shape. His neck took a lot of fiddly work to get right, I found, as the sinuous shape is tricky to render correctly. That part took by far the longest. He has a soft-focus look to him. 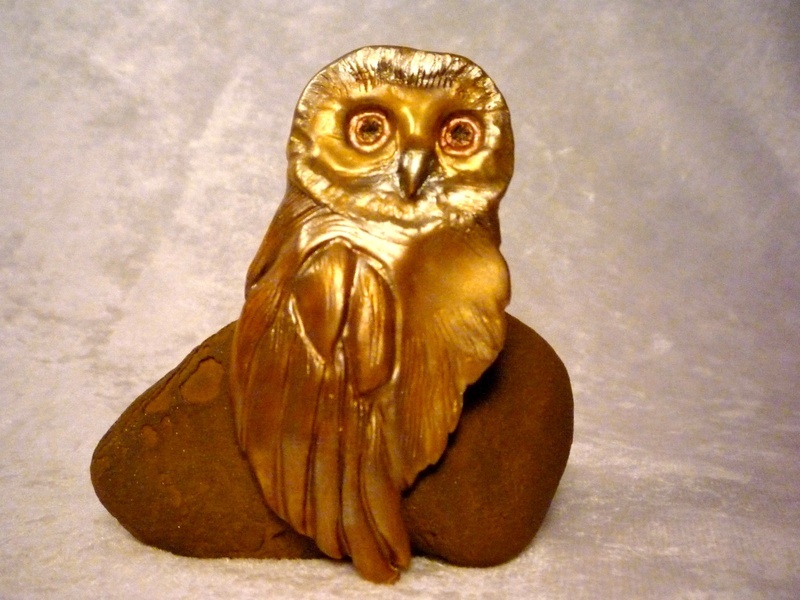 I used Pearl Premo clay to sculpt him, coloring him with white MicroPearl mica powders, with a touch of copper and black for the beak and eye area, before baking. 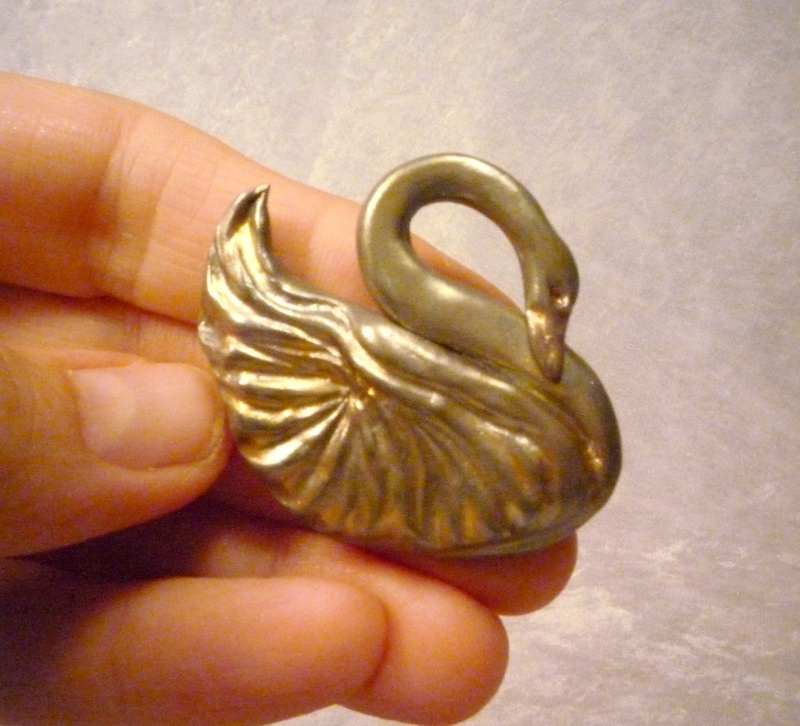 Two metallic-look swans followed the white one, both inspired from an Art Deco brooch, but different in style and shape. 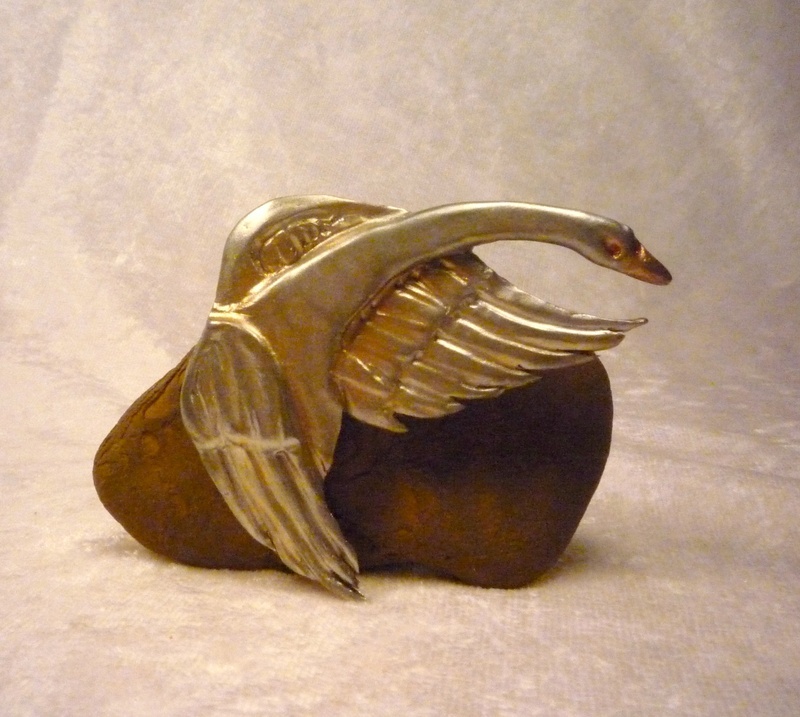 The first has spread wings and a more detailed, feathered look, while the second is more abstract and stylized. 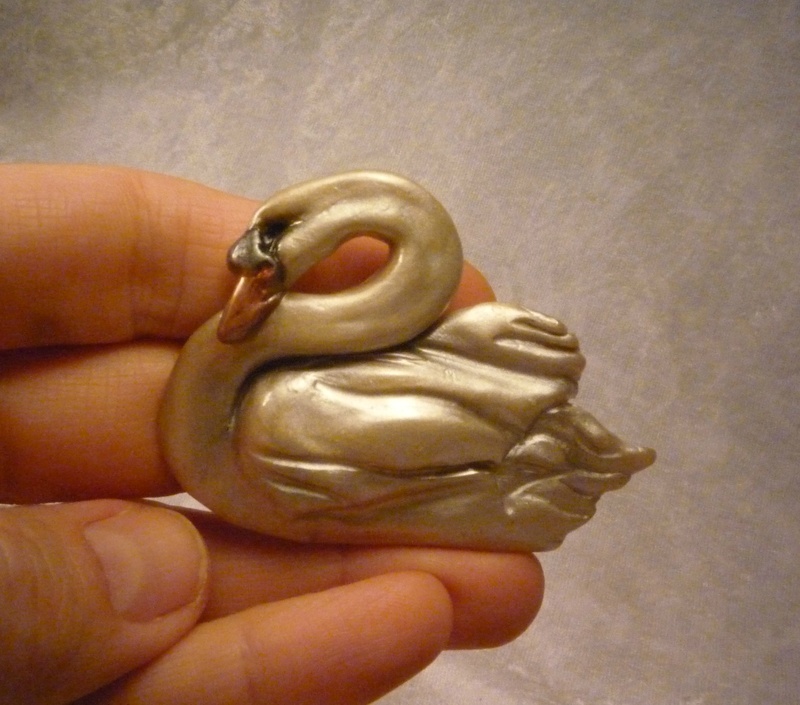 That swan is also the smallest of the three brooches. 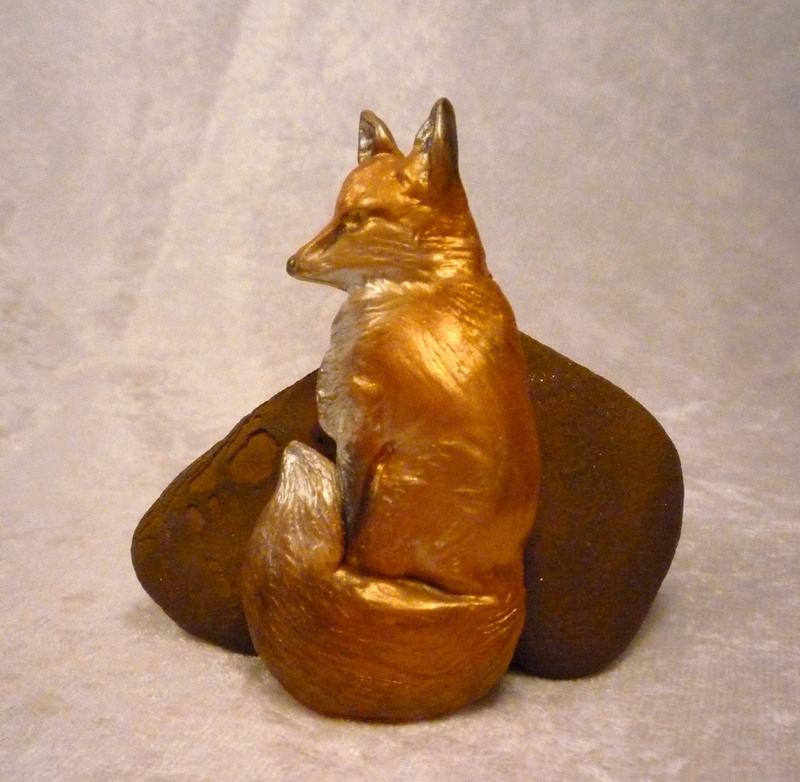 Both of these were sculpted in silver Premo polymer clay and brushed with silver, gold, and copper mica powders before baking. My work has taken a new turn that I am excited about. I decided to work on some brooches yesterday after a few weeks of low production. 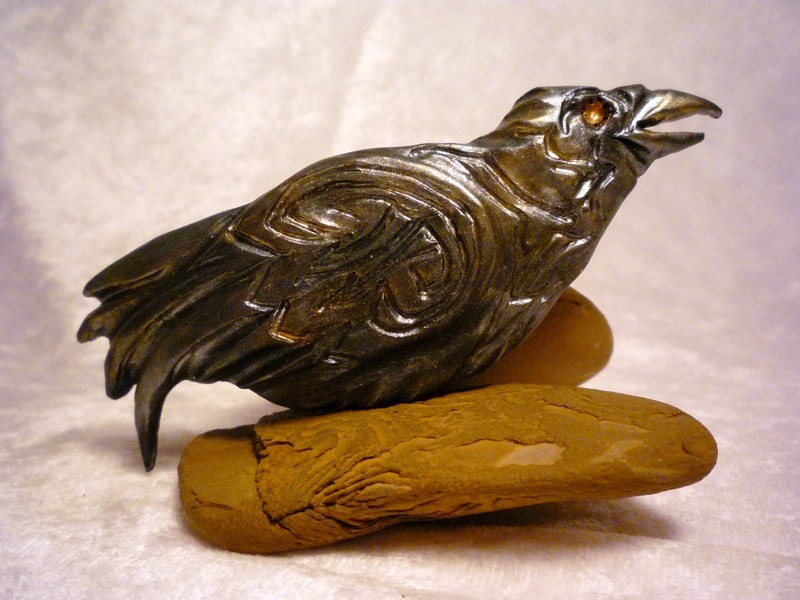 I had some wonderful dark Premo "Blue Granite" polymer clay that I thought would make a dramatic crow or raven, but I wanted to do something different from my earlier ravens. I love Inuit stone carving. In an earlier post, I talked about some of the pieces these carvings inspired. 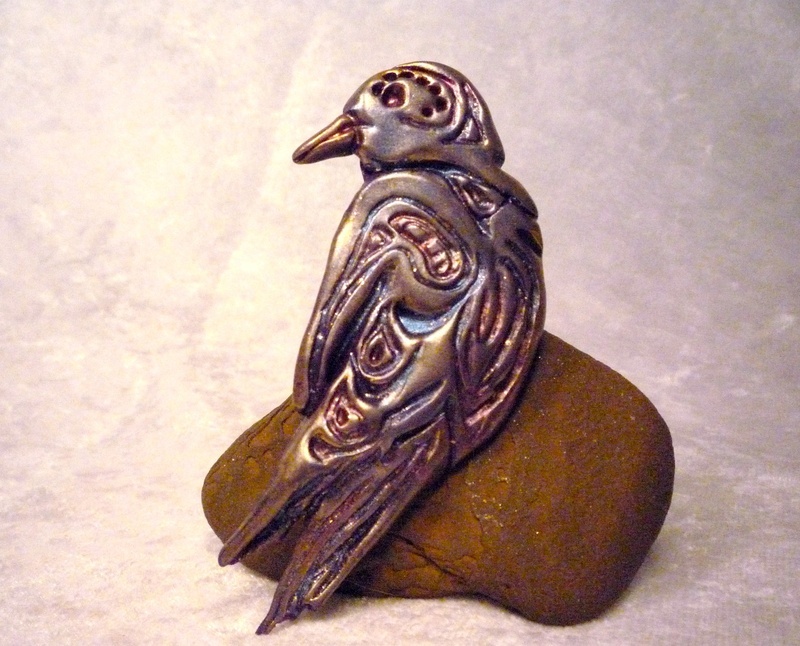 This time, I envisioned something flatter, for a brooch, and I thought about those wonderful Inuit art prints I have seen and enjoyed over the years. 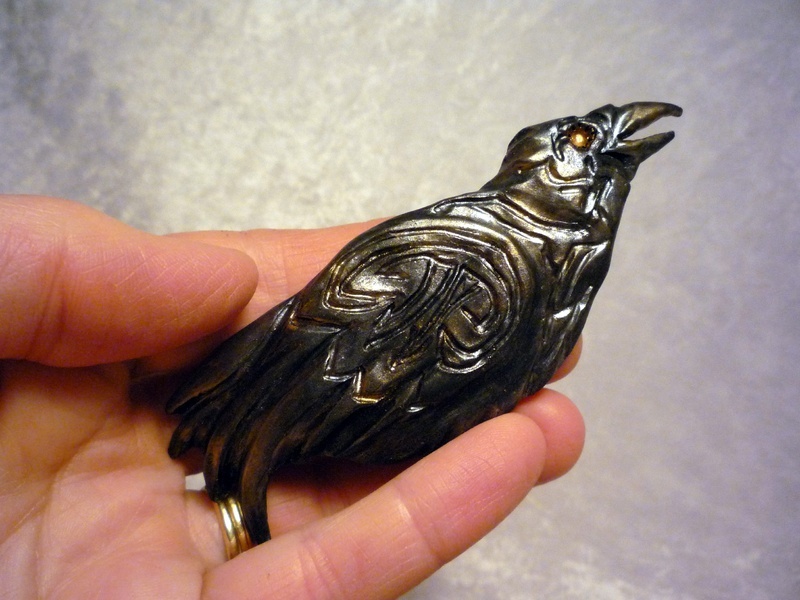 I found a wonderful print of a raven, which directly inspired the first of the two brooches I completed yesterday. I chose to go dramatically bigger in size for these brooches. After shaping the first piece, I attached the pin back by baking a flat strip of polymer clay across it, doubly secured by a coat of liquid polymer clay before baking. I signed the piece on the back. I then used silver and Aztec gold mica powders lightly to create a mottled metallic look throughout the brooch, front and back. The second brooch is made from a mixture of the blue granite clay mixed with black. The shaping and texturing on both pieces was done by hand, without any stamps or molds. 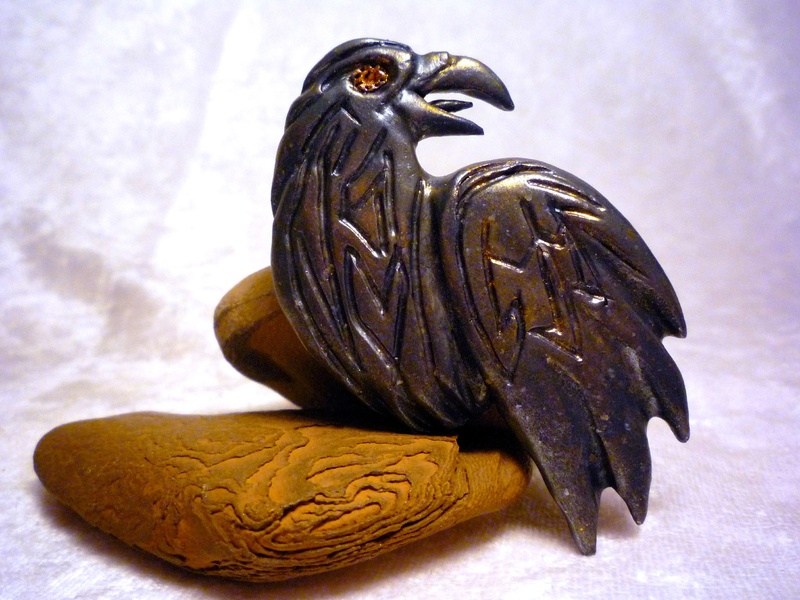 I am very pleased with these dramatic raven brooches, which complement each other, while each retaining a unique and individual look. They have something of a steampunk look to them, I think, especially the second brooch.